3D printing and celebs? Sure, why not? Here at CES 2014, there are plenty - and we mean plenty - of celebrities on the show floor, and we were lucky enough to meet up with one such celebrity to have a quick chat about 3D printing. 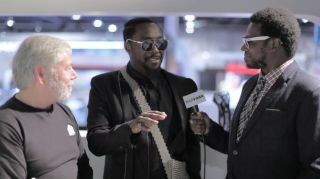 will.i.am of Black Eyed Peas fame has joined up with 3D printing company 3D Systems as Chief Creative Officer. Unlike other star endorsements, it really sounds like Mr. i.am is passionate about printing. Beyond claiming that 3D Systems is the "best 3D printing company" out there then naming off various machines and 3D tech, he spoke about the intellectual property of the industry in comparison to his own world of music and film - specifically saying they want to avoid mistakes that have been made. Avi Reichental, CEO of 3D Systems, reinforces this by saying they want to avoid the "Napsterization" of printing. Check the video below for the whole story.